"I remain a cautious optimist in the progress of the human brain," Garry Kasparov told reporters during a historic chess match last week. "I still believe that there are some horizons it will be very difficult for a computer to cross. Clifford Charles Devlin Thorburn, snooker player (b at Victoria 16 Jan 1948). Since leaving school after grade 10, Cliff Thorburn has played snooker and pool virtually full-time. In 1971 he won the North American Snooker championship and since then has played in 33 different countries. 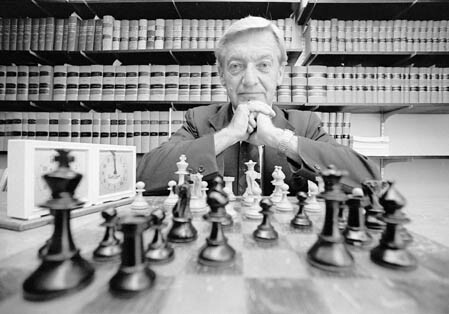 Daniel Abraham Yanofsky, OC, chess grandmaster, lawyer, municipal official (born 26 March 1925 in Brody, Poland; died 5 March 2000 in Winnipeg, MB). Duncan Suttles, chess grandmaster (b at San Francisco, Calif 21 Dec 1945). He moved to Vancouver as a child and became Canada's second grandmaster in 1972. Frank Ross Anderson, international chess master (b at Edmonton, Alta 3 Jan 1938; d at San Diego, Calif 18 Sept 1980). George Chénier, snooker player (born 14 November 1907 in Hull, QC; died 16 November 1970 in Toronto, ON). Kevin Spraggett, Canadian chess grandmaster (b at Montreal 10 Nov 1954). His chess career gained momentum with a second-place showing at the 1973 Canadian Open. Peter Biyiasas, chess grandmaster (b at Athens, Greece 19 Nov 1950). He moved to Canada as a child, began to play seriously in Vancouver in the late 1960s, and won the British Columbia championship 1968-71.